Copag 4 PIP, these poker playing cards are widely used all over the world, made from 100% plastic poker cards. Red and blue marked playing cards are available. Each deck contains 52 cards, 2 jokers and one guarantee card. With Copag 4 PIP Jumbo Index, this Copag marked playing cards is wide size(2½ x 3½). 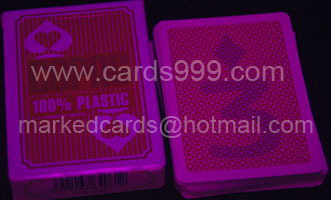 How to perfectly mark 100% plastic marked cards poker, the best infrared marked deck, special invisible ink for playing cards? Blue cards: big suits and numbers can be put in the middle of the back (white mark). Red cards: big suits and numbers can be put in the middle or small numbers and srits can be placed in four corners (white or black marks). Even the blue cards can also be marked perfectly, the result of the red cards will be much better. All kinds of marks can be made, no matter invisible ink contact lenses, infrared marked cards glasses, all can see.